But before I get to that, let me tell you a story, if I may. I’ll give you the short version. About eight years ago, a friend loaned me a copy of Leroux’s Phantom of the Opera, and a CD of Webber’s musical. I wasn’t all that into the book, but I liked the soundtrack. And so an obsession was born. A couple years after that, after a lot of delving into Phantom versions and who-knows-how-many times through the soundtrack, another friend suggested I find Michael Crawford’s other CDs. Crawford was the original Phantom in London and Broadway, and his is the voice on the soundtrack. As my friend suggested, listening to his other CDs would be like listening to the Phantom sing other songs–and it was! And so a new obsession was born. I now have all of Crawford’s CDs because, well, he’s amazing. Somewhere along the way I stopped hearing the Phantom when Crawford sang and started hearing Crawford when the Phantom sang…if that makes any sense! 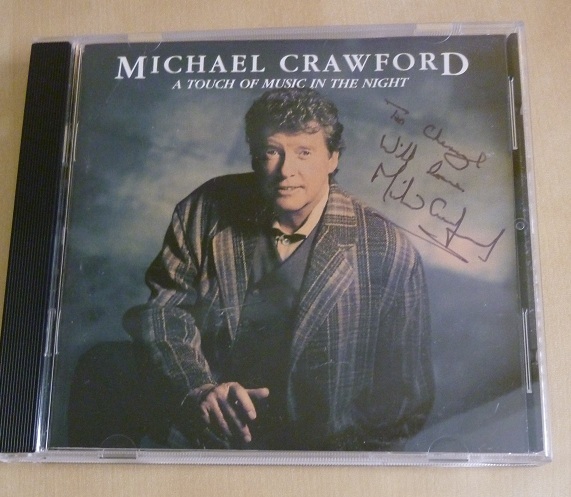 I could have had my Phantom soundtrack signed…but I suspect Crawford signs a lot of Phantom CDs! And I wanted this one anyway, because it’s my favorite. Or to be more precise, the last song on the CD, “A Piece of Sky,” is mind-blowing, life-altering, unbelievably amazing. So I’d say that’s the most exciting mail I’ve had in, hmm, a long time. Couldn’t resist sharing! Have a wonderful weekend, and visit At Home with Books for more Saturday Snapshots! I would LOVE to request his autograph. May I ask where you wrote him to request this? Unfortunately, it was a P.O. Box managed by the Fan Association, and they’ve since shut it down. Sorry I can’t help! Well, that is frustrating. At this point, I’d be happy just to get a chance to send him a letter of appreciation. I only recently got sucked into the “Some Mothers” and “Phantom” scene. I wonder why they closed it? What a voice – my husband and I are big fans of him. I can certainly feel your excitement. How wonderful. That is so awesome. I love, love Phantom, I have seen it 5 times. My mother was fortunate to see Michael Crawford as the Phantom. I love Phantom of the Opera and Michael Crawfor has an amazing voice. I can understand obsessions! I need to go find that song and listen to it! How exciting that you got the CD personally autographed. In England we can’t help but think of Michael Crawford as Frank Spencer. Did his comedy ever make it to America? I don’t know if it ever played here, but I’ve seen some episodes on DVD. VERY funny…and so very far away from the Phantom of the Opera! I think a few episodes were played in the US years ago, but it has not been shown much. A lot of the episodes are on youtube, and I have some on DVD. Most of the episodes hold up very well and are still very funny! I have a few obsessions, too; I can totally relate! Thanks for sharing…and for visiting my blog. How cool that he personally signed the CD for you. That’s a real treasure! I don’t know if I’ve ever heard his music. Neat that you got it signed! I know about obsessions. I’d be thrilled to have this signed CD, too.